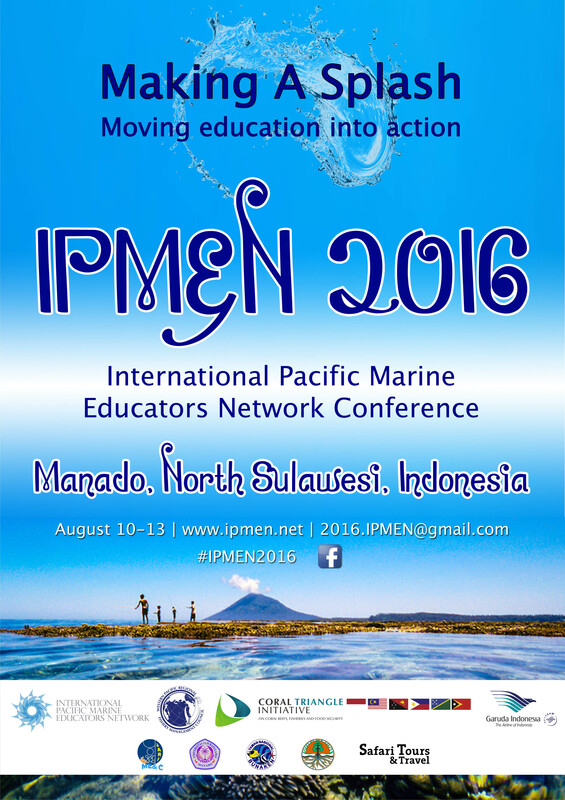 Announcing the IPMEN 2016 Conference. In August marine educators from across the Pacific will be making a splash in Manado, Indonesia for the biannual International Pacific Marine Educators Network conference. Marine educators from all backgrounds will travel to this tropical paradise to meet like-­minded people and create a shared learning community across the globe. A variety of educators from universities, schools, aquariums, conservation NGOs and more will have the opportunity to exchange knowledge, experiences and ideas to improve the quality and effectiveness of teaching about the marine environment, conservation, resources and human impacts. The conference will take place from August 10-13 in Manado, North Sulawesi. The conference immediately follows the first meeting of the Indonesian Marine Educators Network and a special welcome dinner on August 9 will allow these two groups to get together. IPMEN was created in Hawaii in January 2007 at a meeting of marine educators from around the Pacific. This meeting, organized by the Western Pacific Marine Fishery Council, resulted in the establishment of a network of marine environmental educators from 18 Pacific nations and territories. The mission of IPMEN is to foster collaborative relationships that will create the resources, programs, training and leadership necessary to build ocean literacy at every level of society in the Pacific region. IPMEN has grown to become a regionally important organization and invaluable support for marine educators across the Pacific and currently has several hundred active members and typical conference attendances of 50-­100 participants. The overarching theme of the 2016 IPMEN conference will be Making a Splash: Moving education into action. It aims to address the question of how to effectively communicate information about the marine world, and create a more marine-‐literate global community with the capacity to make wise decisions regarding human-­marine interactions. The conference will feature inspiring keynote speakers, ocean game presentations, school visits and web conferencing. Participants will have the opportunity to share their own work, and get to experience the local area and marine world with excursions to Bunaken National park, the Coral Triangle Initiative Centre and Sam Ratulangi Univeristy. The conference is focusing on hands-­on experiences and so will feature a beach clean-­‐up with local schools and coral transplantation activities. It will be a fully immersive experience in all facets of marine education. Registrations are now open for potential presenters and participants. Visit www.ipmen.net for more details and to register for this wonderful experience. 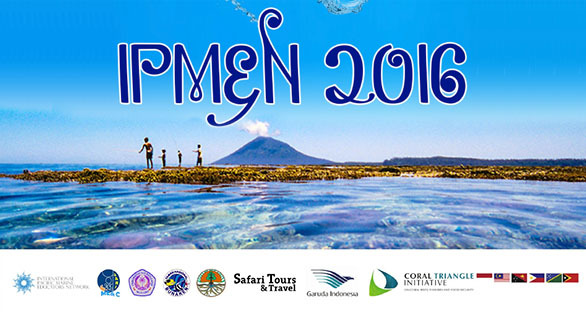 Marine educators from across the Pacific will gather in Manado, Indonesia (and elsewhere via web-conferencing) in August 2016 to exchange knowledge, experiences and ideas to improve the quality and effectiveness of teaching about the marine environment, conservation, resources and human impacts. They will build on previous work by IPMEN and continue to share resources and develop collaborations. 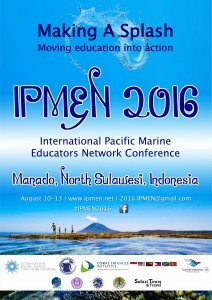 The conference is scheduled to immediately follow a two day meeting of the Indonesian Marine Educators Network. Innovation in Marine Education -­‐ using new and different teaching methods to deliver the marine message and reach a wider audience. Sea Stories and Coastal Culture – integrating traditional knowledge into formal and informal marine education. Partnerships for Change – connecting across the seas to achieve common goals and strengthening projects through collaboration. Sustainable Seas – utilizing the oceans’ resources to ensure their survival for future generations. Making Science Accessible – demonstrating the relevance of science in our everyday lives and helping to create a more marine literate society. IPMEN was created at a meeting of marine educators from around the Pacific in Hawaii in January 2007. This meeting, organized by the Western Pacific Marine Fishery Council, resulted in the establishment of a network of marine environmental educators from 18 Pacific nations and territories. The mission of IPMEN is to foster collaborative relationships that will create the resources, programs, training and leadership necessary to build ocean literacy at every level of society in the Pacific region. IPMEN has grown to become a regionally important organization and invaluable support for marine educators across the Pacific.